The specific light distribution of Orus minimises light loss within the volume of space between the luminaire and the road. This is especially valuable on bridges where wet weather conditions (rain, mist …) may attenuate the light dramatically with high mounted luminaires. Each luminaire within the scheme has a specific task and task area. This maximises its efficiency by not spreading the light over too many tasks and areas which would result in over lighting and waste light. The positioning of the E/fact luminaires in the arches with tight beam control and low mounted Orus’ maximises useful light by minimising the amount of spill light. The lack of spill light can be seen by the darkness of the river on either side of the bridge. 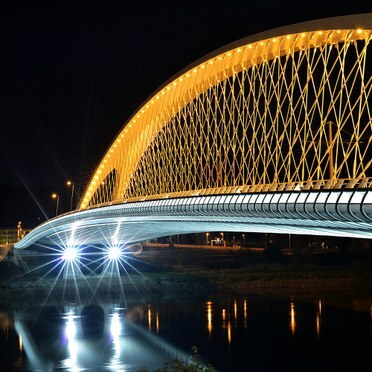 The newly opened Troja Bridge is set to become a big attraction in Prague, Czech Republic. It impresses tourists and residents alike as the only bridge over the Vltava River without pillars. Its unique bowstring-arch structure is 200m long incorporating a double tram track and four traffic lanes for vehicles, pedestrians and cyclists. The bridge is stunning during the day but comes alive at night when the effect of the carefully designed illumination can be fully appreciated. 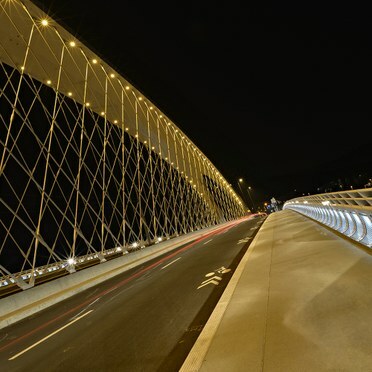 The designers from Studio Koutský Architekti understood at the project conception that the light and lighting of the bridge would play an important role in the overall look and effect of the construction. In search of the perfect lighting solution the architect Mr. Kábrt worked with Walter Jagsch, lighting designer at Thorn Lighting, to develop a lighting design to compliment this intricate structure of webbed wires. hangers, they create an unforgettable image. With its low contact temperature and precision optics, E/Fact also illuminates the tram tracks. It was challenging to find a solution to house the products safely but still allow service access, but Thorn worked with the architects to find an easy solution. Orus luminaires were chosen to illuminate the road and sidewalk. Using a 3000K colour temperature creates a visible contrast with the illumination of the arch. 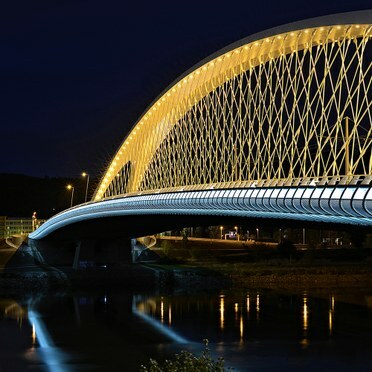 Orus' low mounting height of 0,9m is discreet and ensures the lighting integrates into the landscape without interfering with the structural design of the bridge. Due to its unique Flat Beam® technology, Orus produces a precise light beam which provides a comfortable light for drivers and does not dazzle road users. At the same time, it illuminates the road lanes, the sidewalk and the bike path. For easy access, the Orus luminaires are placed in hinged boxes that safely conceal the wiring. In the railings, E/Fact LED (5700K) is installed both for decorative lighting and to illuminate the sidewalks. The luminaires are positioned 1m apart, so that they can simultaneously illuminate the side cover and create a unique design with the characteristic outline of the bridge. At the foot of the bridge on both sides Contrast R floodlights with antiglare optics have been installed. Their cool white light with a colour temperature of 5500K creates the coolest element of the lighting solution. The bridge deck is visually lightened from below so that an optical illusion of the bridge hovering above the river is created.